Sandeep Bodhanker’s young age belies the depth of understanding and height of expression he has achieved in the art of Kuchipudi dance. He started his dancing career at the age of three, and his first major solo performance was with Sanskara Bharathi at the age of 9. Due to his immense talent, deemed as a God-gift, Sandeep Bodhanker has already attained great accolades in his field through his countless performances, and has received numerous awards and honours. In addition to his personal performance work, Sandeep Bodhanker has also ventured into producing much needed high quality Kuchipudi dance music, which is available on CD. Sandeep Bodhanker’s cultured and tuneful voice is the result of 4 years of solid Carnatic vocal training at Telugu University, Hyderabad. In addition he is currently undertaking a Masters Degree in Business Administration. Sandeep makes regular visits to his beloved gurus in Kuchipudi Village, AP India, to retain his close connection with the dance form, its ancient culture and to work with them to preserve Kuchipudi in its purest form. As an industrious scholar and researcher, Sandeep is able to keep the deep and beautiful traditions of the dance alive today. He has a keen interest to explain the history, and to demonstrate the practical and spiritual aspects of Kuchipudi dance in all its subtlety. For this purpose he has developed practical workshops to give a basic introduction as well as a more advanced insight into this unique and distinct art form. In recent years Sandeep Bodhanker spent time lecturing at Shri P.K. Salve Kala Pratisthan - International Academy of Music and Dance, Mumbai, where he instructed and choreographed students from all over the world. Seeing the great response from his overseas students, this gave him an even greater desire to take this ancient art form into the 21st century, and to make it more accessible to people throughout the world. Based in the United Kingdom, Sandeep Bodhanker wants to bring this unique classical Indian dance style in its pure and unadulterated form to new audiences. It is his absolute mission to preserve the pure and old tradition of Kuchipudi, and to help the world to discover and enjoy the incredible dynamism, the inspiring spiritual aspect and the immense beauty of Kuchipudi dance. 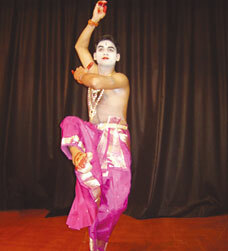 Sandeep performs at the Indian High Commission in London. Read the review here. Sandeep performing in Guarulhos, Brazil.